Cyclone Phyan might not hit Mumbai directly, though the metropolis will feel its impact due to extremely heavy rainfall, Mumbai meteorological department officials said on Wednesday. 'The cyclone may not directly hit Mumbai, but the impact of the severe weather has already started in the city. In the afternoon perhaps, it will be more severe. Disturbed weather is expected with heavy rains, storms and the sea will become very rough," said a met department official. 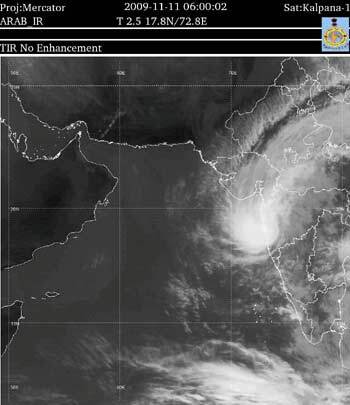 Cyclone Phyan was currently 350 kms away from Mumbai, said IMD officials. 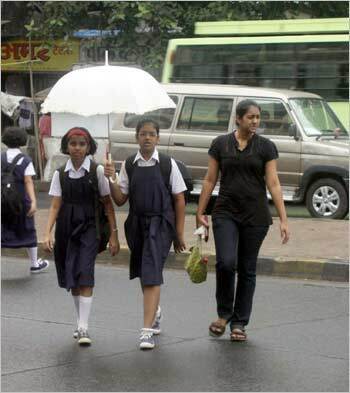 Image: School kids in Mumbai braving the heavy rains. Under the influence of the deep depression, rainfall was experienced in most parts of Maharashtra on Wednesday, with heavy to very heavy showers at few places including the metropolis and neighbouring Thane district. "As far as Mumbai and coastal areas are concerned, we have informed the state government, disaster management authority, Brihanmumbai Municipal Corporation to take all precautions for the safety of life and property. We have advised people in low-lying areas to take shelter," he said. Extremely heavy rainfall is likely in Konkan and Goa and central Maharashtra, the met office bulletin added. Additional buses and trains have been deployed in Mumbai to deal with the congested traffic, said Maharahstra Chief Secretary Johny Joseph. Nine rescue teams have also been deployed in Mumbai, he said. The BMC and the state government will keep a track of the route of the cyclone, which might alter its course every hour, Joseph said. Maharshtra Chief Minister Ashok Chavan said, "Emergency and Disaster Management Cells have been activated." "All schools and offices have been advised to close down for the day in view of the inclement weather that is likely to worsen," BMC Additional Commissioner A Maheshkar told reporters. While the schools have been asked to shut down at 1 pm, offices have been advised to close by 2 pm, Maheshkar said after a high-level meeting chaired by Joseph at Mantralaya. The machinery has been geared up to promptly clear the streets and people have been cautioned against taking shelter under trees. Asked if the advisory for closure of educational institutions and offices would be in force even on Thursday, she said no such decision had been taken as yet. 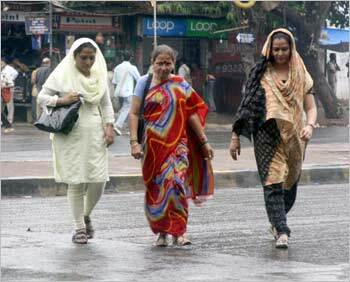 Image: Mumbaikers suddenly caught unawares from the heavy showers since on Tuesday. Mumbai a city of 'slum dwellers'?